BOO! It’s Halloween time! For you crafty types it’s a very exciting time of year filled with all kinds of crafting possibilities! My kiddos were getting tired of my all my Coastal Pumpkin Decor and wanted something (quote) “more cool and spooky for us mom!” I heard ’em loud and clear. Time for them! 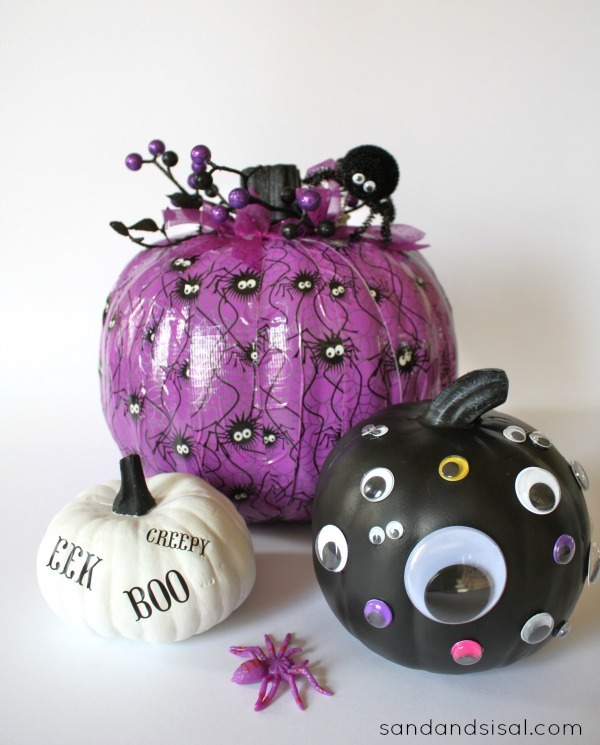 Duck Tape® has so many fun patterns available that the Halloween decorating ideas are endless! Let’s make some Spooky-Cool Duck Tape© Pumpkins! 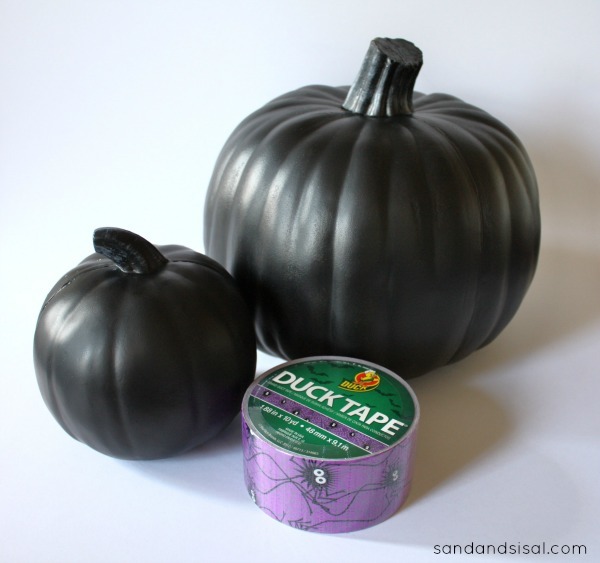 Start at the pumpkin stem and apply your choice of Duck Tape© to the pumpkin and rip it off at the pumpkin base. 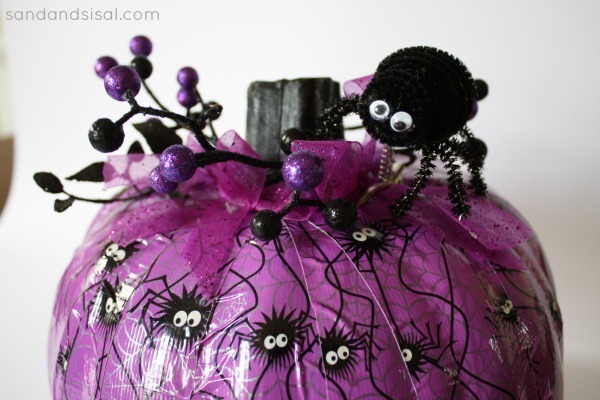 I adore this cute, googly eyed spider on a webbed, purple background. Repeat all the way around the pumpkin until it is completely covered. Then cut apart your glittered floral stems and twist them around the stem. Tie a few little bows with some glittered ribbon and hot glue them to the base of the stem. Finish your pumpkin with an adorable google-eyed, fuzzy craft spider. 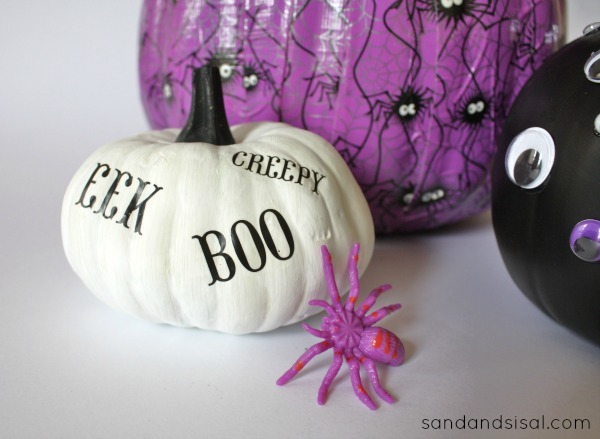 To make the Halloween lettered pumpkin, either hand write spooky words with a permanent marker or use some easy Mod Podge rub-on word transfers. Just cut them out and rub them on. (I used the tip of a spoon to rub them on). So simple! For the last fun pumpkin, I went with the whole googly-eyed theme and hot glued on various sized google eyes onto a black craft pumpkin. Somebody’s watchin’ me…… Duck Tape© is running a fun contest all month long. The Duck Tape® Stick or Treat Contest is your way to showoff your creative talents! All you have to do to enter is submit an image of a Halloween pumpkin (real or fake) decorated with Duck Tape®! The contest is already running and wraps up on October 31st. The winners will be announced on November 11th. If you enter then be sure to leave me a comment here with your link so we can all check it out! 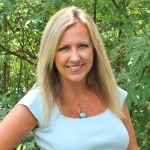 Follow @TheDuckBrand on Twitter for tons of creative inspiration! Click on the the PURPLE BUTTON below for contest details and to see all the new and cool Duck Tape© prints! so clever, I love this! !